July, when we first start to witness the fact that we’re past the equinox, as we go from a day length of nearly 16 and three quarter hours at the start to just 15 and a half hours at the end. We start to get some true darkness back towards the end, too, but only for about half an hour around one in the morning. As soon as the skies do start to darken, though, it’s a great time of year for satellite-spotting. There are thousands of objects orbiting above our heads, most of which are too small or dark to be seen. Some, such as the geostationary satellites that bring you those wonderful television programmes, are too far away to be seen. In order to remain over the same spot on the Earth’s surface, they have to maintain an altitude of more than 22,000 miles and you would need pretty good eyesight to spot a ten-foot satellite at that distance. A lot of the visible satellites are, in fact, just the spent launch vehicles which are usually painted white for thermal protection and so reflect the sunlight perfectly. Being no longer powered or controlled, they often end up tumbling, giving the impression of flashing as they cross the sky. What could be better than sitting outside on a warm(?) summer evening, maybe with a few friends, possibly(?) with a little something to drink, watching the sky. It’s never very long before someone spots a star-like dot wandering across the sky at about the speed of a passing aircraft but without the flashing lights. This usually opens the floodgates and as your eyes adjust to the lower light levels there follows a veritable murmuration of satellites. Of course, the grand-daddy of orbiting objects is the International Space Station. I think everyone should make an effort to view this amazing spectacle. You’ll need to go online (or get a young person to do it for you) and look up http://www.heavens-above.com to get a prediction of when it will be visible. Occasionally, the vehicles that resupply the station are visible and there are two scheduled for launch this month. First, with no specified date, is an Orbital ATK Cygnus, due to be launched from NASA’s Wallops Space Flight Facility. Second, due for launch from Cape Canaveral on the 16th, is a Spacex Dragon craft – dates may change so http://www.heavens-above.com is the place to go. Even brighter than the ISS are the Iridium satellites. These are used to communicate with satellite telephones and there were due to be 77 of them – which is the atomic number of Iridium, hence the name. In order to receive the relatively weak signals from a sat phone, they are equipped with three large aerials which have a very shiny coating to keep them cool. These make perfect mirrors to reflect the light of the Sun, but only on to a single spot on the Earth’s surface which moves at the speed of the satellite – about 17,000 miles per hour, giving the effect of a really bright flash as it passes (pictured above). 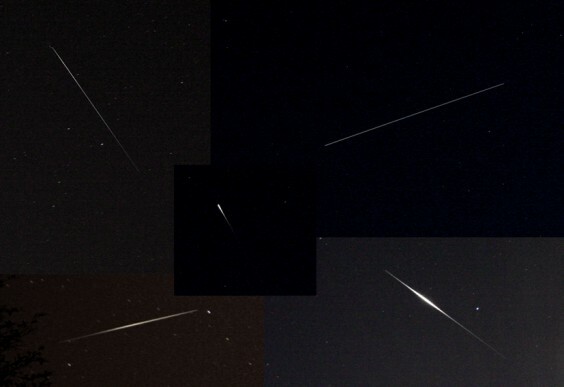 Fortunately, heavens-above predicts these too and with a bit of time exposure you can actually photograph them. So, find yourself somewhere pleasant to sit end enjoy the free light show in the sky.